Oops. So the blogging thing is going really well, right? Ahem… Thankfully my running resolve is stronger than my writing resolve and I’m still managing to get out 3-4 days a week – not quite the dizzying heights of Janathon, but then that was a temporary madness. Training: my shin splints have pretty much recovered thankfully, so I’ve reintroduced interval training at least one session a week. I’m still on a low level with it to be honest, but it’s started to get to a stage where I don’t want to die/throw up at the end of the session, which I think means I have to turn it up a notch pretty soon. Oh goody. In terms of mileage (or kilometerage – I’m a metric chick after all) I’ve clocked in around 70km in February, 80km in March, 60km in April and about 45km so far this month. April had a bit of a dip because I caught a cold, which developed into a lingering chest infection. It’s still hanging around a bit, but has thankfully improved enough to allow me to run again. Racing: I’ve taken part in two 10k races since Janathon, both with improved times on that rather horrid New Year’s Day 10k in Hyde Park, but neither exactly setting the world aflame 🙂 I’ve decided I don’t really care that much about that anymore and I just want to focus on enjoying my runs rather than beating myself up for not breaking the 60min barrier. I’m sure I’ll get there eventually, but I don’t want to turn the running into something that ends in disappointment rather than elation. The two races were nice and small. 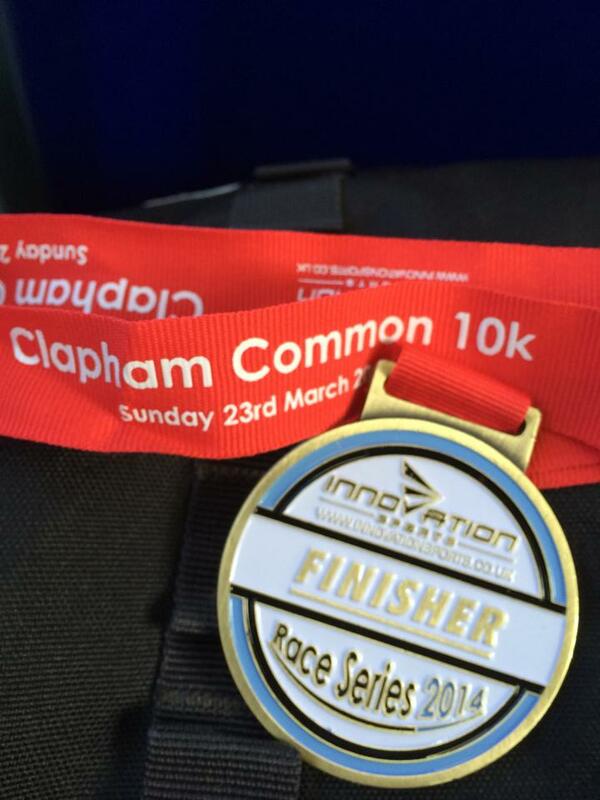 First was the Clapham Common 10k in March, which was the first of a series organised by Innovation Sports. I try to run at least a couple of these each year – they are fantastically organised and really friendly. I’d really recommend them to any of my London readers. Oh and there is a lovely medal at the end, of course! 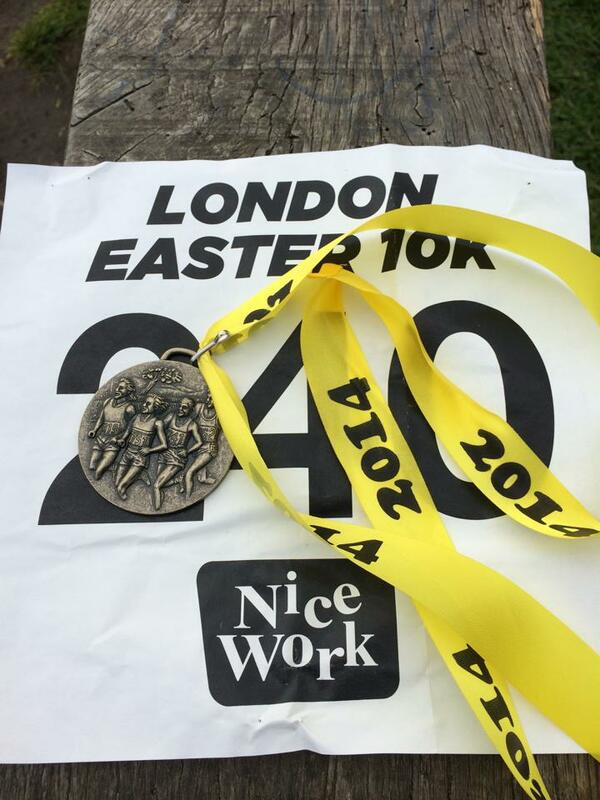 The second 10k was on Easter Monday in Regent’s Park, organised by Nice Work. It was the first time I’ve run anything organised by them and I was pretty impressed. Everything was well organised and although it didn’t feel quite as friendly as the Innovation series, I was happy enough hanging around on my own. My main complaint is that I was lured into entering on the promise of a chocolate egg after finishing and this failed to materialise. Instead I got a fig roll. I like a fig roll as much as the next woman, but chocolate it aint! It was also far warmer than I was expecting and I was woefully underprepared for the heat, which meant I really struggled in the last 3k – all good learning though. And the medal is nice – I do love a medal! I’ll be having a bit of a rest month in June, so no Juneathon for me. Two weeks lounging in the Crete sunshine await instead. Mmmmmm….. Then when I get back I’ll be kicking off my training for this year’s big race, the Royal Parks Half Marathon, which I’m looking forward to a lot. So there you go, that’s more or less what I’ve been up to. The only other bit of news – and it’s a biggie – is that I successfully applied for a charity place on the Virgin London Marathon next year! Eeek!! I have been thinking about doing a marathon for a while and I’ll be turning 40 next year, so I decided that it should be a thing I do before I hit that milestone. I’m also in the ballot, but I know how difficult it is to get a place that way so I put in a couple of charity applications and got a call this week from one of them confirming that I was successful. I’ll be running for the Evelina children’s hospital, which is part of the Guy’s & St Thomas’s Hospital trust and was where my niece was admitted and treated a couple of years ago when she developed infant epilepsy. It’s a cause close to my heart, which is just as well really as hitting the minimum target is going to be quite a challenge. Expect many blog posts to come in the run up to the VLM – I’ll be regularly updating you on both my training and my fundraising progress.